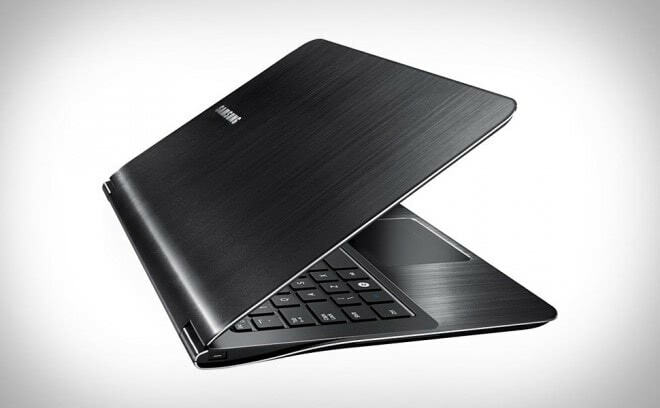 This week I've been testing Samsung's new Ultraportable laptop, their Macbook Air equivalent. Yesterday I wrote about the hardware itself which is absolutely gorgeous and even lighter than the Air. Today I'll be wrapping up this review by talking about what the Series 9 (known in the USA as the 900X3A) is like to use day to day. This laptop has the fastest BIOS I've yet seen on any computer. It gets to the Windows Starting logo in four seconds from a cold boot and you're at the desktop within 20 seconds. This is really excellent and shows that Samsung have gone out of their way to get the BIOS right on the machine. Using it is just as pleasurable an experience. I'm used to the power and speed of a Core-i7 desktop machine but I'm delighted to be able to announce that the dual core i5 processor in this machine is just as speedy in day to day usage. It shows four physical cores with hyper-threading and combined with 4Gb of RAM is no slouch. There's nothing I tried to do on this laptop that slowed it down or showed any kind of delay whatsoever. This is all down to the new Sandy Bridge architecture from Intel which is quicker and runs at lower voltages than previous chips. It's not all great news though as while the exterior of this laptop might have been designed with the care of a master craftsman, the software implementation is much more sloppy. As is common with many PCs these days the thing is loaded with trialware and bloatware. These include lots of extra games, all of which you have to buy to play past a short trial level, and pointless extras such as a video showing off the laptop. Why would I want to see a video showing off this laptop when I've just bought the thing? More depressing though was that the Windows implementation on board was pre-service pack 1 and also without Internet Explorer 9. The Series 9 is a luxury product and, as such, I'd have hoped that Samsung would have taken more care with the software. This means the first thing you'll have to do with it is download and install quite a hefty pile of updates. With this out of the way though you quickly forget about the problems it caused. It's worth noting that the Series 9 is one of those computers that actually does come with a full copy of Windows 7 on DVD. This is important to note as too many PC manufacturers don't bundle this any more, even though you've paid for it. Should something go wrong with Windows (which is inevitable eventually) it's an essential thing to have around. I wasn't completely sure about the multi-touch trackpad. Some of it's features stopped working for me properly, such as the two-finger-tap for a right click. I put this down to a driver update which I'd installed though. One great feature is what I call "boss mode" where sliding four fingers down the trackpad will automatically minimise anything you have on the screen. It could be argued though that if you have one of these laptops, you're more likely going to be the boss. The ports sit in two fold-down flaps on either side of the machine. There's USB2 and USB 3, Gigbit Ethernet (though this requires an adapter cable that's supplied), mini HDMI (so again you'll need an adapter to do presentations from it), a joint Microphone / Headphone / Speaker socket (though the internal speakers are generally excellent with high volume and good depth of range) and finally and perhaps less usefully a Micro SD card slot. In the place of this it would have been much better to see either a full SD card slot or, preferably, a SIM card slot. I don't really get the point of an ultraportable that has to rely solely on wifi!? Of course you could plug in a 3G dongle, but why would you want to with something that looks this good? For me this is the single biggest oversight with the machine. 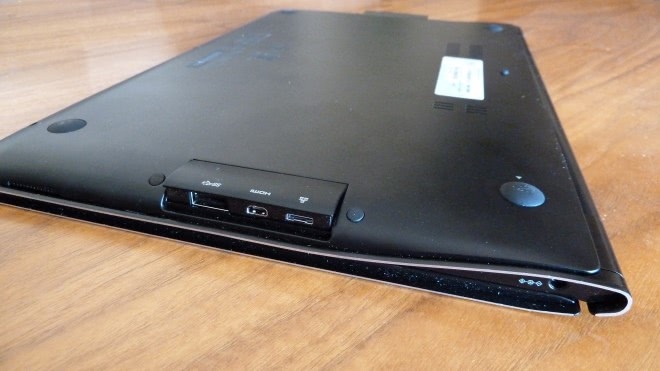 One thing worth noting with the ports is that, while it's fantastic to have them hidden away under flaps, if you plug in a thicker than usual USB flash drive the whole laptop will wobble a bit while its there. This is just down to the thickness, or rather should I say the overall thinness of the machine. The screen is absolutely glorious and one of the best things about this laptop. It's so bright that you'll never be able to use it at maximum brilliance indoors. This bodes very well for using it in direct sunlight where it should always be perfectly legible. It's a pity though, again especially for a luxury product, that the resolution is just 1366 by 768. I would rather have seen a full 1080 screen for this price. A really useful feature is that if you press the F4 key from startup you'll be taken to a helpful GUI where you can back-up and restore your copy of Windows and also troubleshoot common problems as to why it won't start. This is essentially a custom skin built on top of the Windows startup repair, but it's a lovely addition and very welcome. It's also worth talking about the keyboard. This scrabble-tile affair is large and well spaced and, unlike the near £100 logitech keyboard I have on my desktop PC at home, I have never hit the wrong key while typing on it. This keyboard is simply fantastic. To balance out fantastic though I did have the power lead fall out of its socket a couple of times. The magnetic arrangement on Apple laptops is much better in this regard. Battery life is again excellent. Even though its built-in so can't be changed, you'll get about 6½ hours in light usage, falling to around four or five with wifi on. Under heavy load you'll still get over two hours of life for it which is good for any current laptop. So, is the Series 9 a Macbook Air killer? Currently I'd have to say yes, despite the high price. This is due to the performance of the machine and just given a boost by how utterly gorgeous it looks. Anybody who buys one of these laptops will be thrilled to bits with it. It's fast, responsive, has excellent battery life, comes with almost every feature you'll need on the move and weighs next to nothing. Though with the Macbook Air about to get a Sandy bridge update, the Series 9's reign on top could prove to be short lived.